We had a great day yesterday. It was one of those afternoons that I just sat back and enjoyed. I went to the gym in the early afternoon (for the first time in forever!). When I got home the baby had just woken up but it was a little early for him to eat but he was not having it. Jackson had some errands to run so I decided to put Jax in the Baby Bjorn and venture outside to keep him occupied until it was time for him to eat. The moment we stepped outside, he passed out. It's like magic. The few times he's been fussy and I've gone outside, he's gone right to sleep. So I took a walk with him around the neighborhood while he slept and then he ate. Afterwards I decided to take him back outside since it was an absolutely beautiful day. 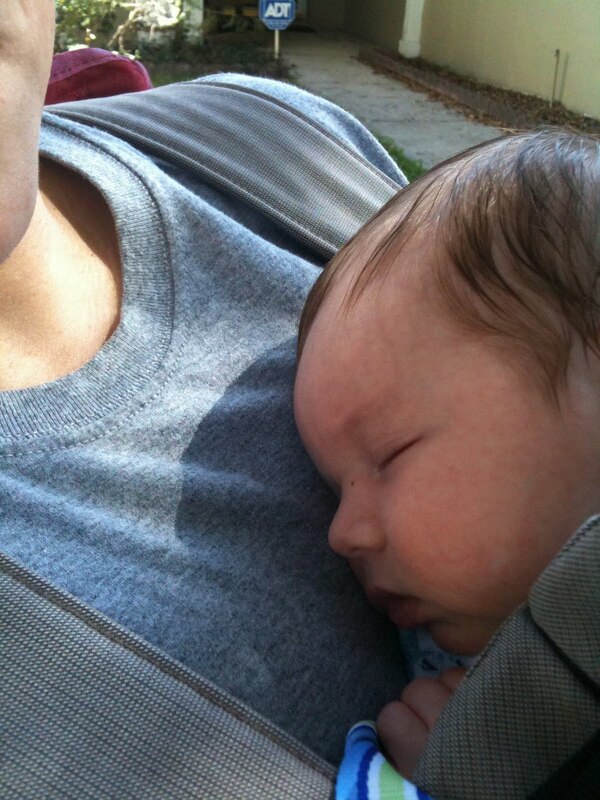 So armed with a big sheet and a few magazine, the baby and I headed outside. We had a blast. He just kicked and moved and smiled as I played with him. Of course, we were in the front yard (our backyard needs work done) so when daddy got home he was a little embarrassed that we were hanging out in the front yard. He did give in though, and pulled up a chair and hung out for a while. We then decided to head to Sonic for dinner which was a blast. We parked and ordered our food and I took the baby out of his carseat and brought him up front with us. I found one of my old mix CDs from college and put it in and proceeded to sing (in a very bad voice) to the baby. Neither he or Jackson were impressed. Ha! After we ate I had to change the baby so I opened up the back of the truck and changed the baby, which, according to Jackson, solidified my status as a hillbilly. First I hang out with the baby in the front yard and then I change diapers on the tailgate of the car at Sonic. I spent the whole dinner laughing. It certainly wasn't our "typical" dinner date that we would have before the baby was born, but it was a load of fun and I wouldn't change it for the world!